For fun for everyone, hop on the new Airhead Thrust towable tube, a deck-style tube designed for lie-on stomach-down riding that offers an exciting experience and is ideal for bumpy conditions. Its largish size of 189cm length by 140cm width accommodates one, two or three riders. 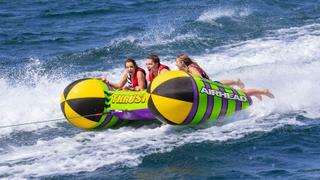 The Thrust rides on its two sponsons, allowing the tube to get more air time and limiting harsh jolts. It features a durable 30 gauge bladder and extra strong double stitched 840 denier nylon that envelopes the entire tube. 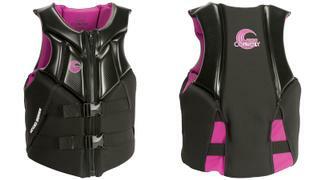 US Coast Guard-approved flotation vests for wake sports have a tendency to be bulky. However, the fashionable new Connelly Concept Neo vest provides excellent mobility thanks to small panels of flotation throughout the vest that hinge as you move. Available in men’s and women’s cuts, the armholes are large and contoured to reduce chances of the vest riding up into your armpits while the women's Concept is shorter to fit better around the hips. The smooth black Glideskin panels are not only attractive but also repel water, making the wearer lighter, and a front zipper and two buckles offer fit and security. Kids and wake sport novices love kneeboarding. It is simple to learn yet offers the potential for many advanced on-water and airborne tricks when jumping the boat’s wake. The O'Brien SoZo is a compression moulded fibreglass kneeboard designed to be lightweight but strong. It has a thin profile that allows it to spin easily on the water and get plenty of air off the wake along with a very thick pad contoured to your knees and shins to make riding more comfortable even when landing big jumps. The SoZo is a high level kneeboard that novice to advanced riders will love. Surfing behind a boat just got even easier with the debut of the Connelly Big Easy. With its 167cm length and 53cm width, the Big Easy is Connelly's biggest wake surfer to date. It has a traditional surf style design, featuring three deep fins at its tail that allow you to do exceptional surf style carves behind the boat. The Big Easy features a full length EVA pad on the top that, when combined with its ample surface area, allows you to ride either on the tail or nose of the board. The Big Easy is ideal for beginner adults and heavier adults who want to get on the water and shred the wake. New for 2019, HO Sports Hovercraft is a new type of slalom ski that is ideal for beginners or skiers who want to have fun on a single ski. The Hovercraft features the traditional slalom binding placement of one foot in front of the other but is much wider than the traditional slalom ski making starts much easier for beginners or heavier adults. The added width is ideal for bumpy conditions and slow speed skiing under 25 mph while it is available in three lengths for optimum suitability. Like a wake surfer, the Hovercraft features swallow tail design and three fins on the bottom. The tail design and added fins give this ski additional traction during starts but also makes edging to the wake and turning easy. The thin profile, added width and added fin stability allows aggressive skiers to get big air during wake jumps. 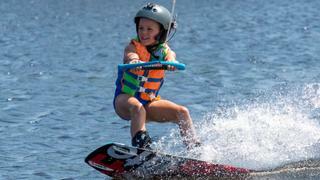 Wake surfing is easy and fun for everyone, but it's easier for kids to do on a board that fits them. 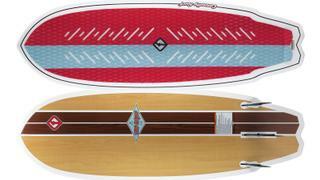 That's why Liquid Force has unveiled the Gromi, a 117cm long skim style wake surfer. The Gromi’s smaller size makes it easier for kids to control the board during the start and, once up, the smaller size is more manoeuvrable allowing them to carve and do tricks. The Gromi comes with a three fin set up that allows little rippers to choose from a loose ride with a single fin in the centre, two fins (one on each side of the board) or triple fins for maximum traction. If you are a water sports fanatic who wants to be able to communicate easily with others on the water or on board, the Bb Talkin Advance two-way communication device is the perfect investment. The device is compact and attaches to a hat for people in the boat or to a helmet for those in the water, is waterproof and specially designed for a saltwater environment. The Bb Talking Advance allows up to four people to communicate at the same time and the system has a one mile range making ideal for coaching or providing feedback. Boards for wake surfing continue to evolve to fit a variety of skill levels and surfing styles. The latest advances are found in the Liquid Force Primo LTD. This surfer can be used traditionally by standing on a pad on the board or with add-on foot straps that make starts and learning new tricks on the wake easier since you have more foot control of the board. Once you learn the tricks, remove the foot straps for a freer feeling ride. The Primo LTD comes in three sizes: 135cm, 145cm and 155cm.